Kingdom Hearts III wurde nun angekündigt! Das Spiel befindet sich derzeit exklusiv für die Playstation 4 in Entwicklung! Leider hat sich das mit dem "exklusiv" heute auf dem "Die Zukunft von Final Fantasy" - Event schnell verabschiedet. Der Titel wird ebenfalls für die Xbox One erhältlich sein. 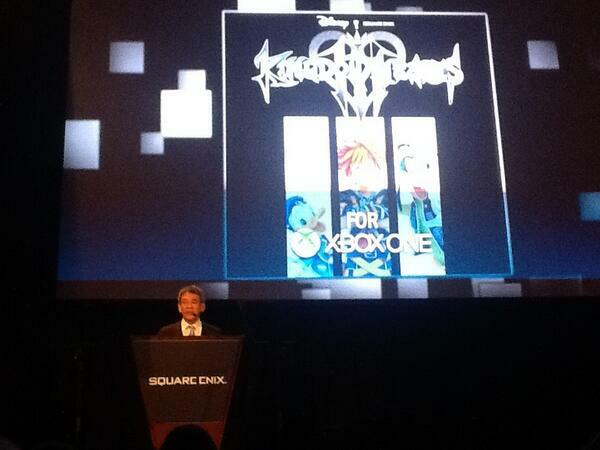 The CEO of Disney Interactive John Pleasants came on stage with new Square Enix CEO Matsuda. They announced that a more mature Sora with Mickey, Donald and Goofy will be featured along with new Disney worlds. The game was also announced to be coming out on the Xbox One, alongside PS4. There will apparantly be no plans to make other KINGDOM HEARTS titles available for Xbox platforms. The Osaka team, responsible for Birth by Sleep and Dream Drop Distance is developing KH3. Hashimoto to PS4 fans about FFXV/KH3 on Xbox One: first time they’ve revealed a game for multi, rather than announced later. Please understand. Hashimoto doesn't want to comment about a Wii U port right now. Mickey and Riku search for previous Keyblade wielders. They can't answer anything about whether Pixar will be in KH3 or not. Die ersten provisorischen Packshots sind da! Tetsuya Nomura wurde von verschiedenen Leuten interviewt! Alle Interviews sind auf Englisch, aber leicht verständlich! First he was asked about the origins of the 'Kingdom Hearts' name and the series. Nomura explained (via translator) that the origins of the name lies in that they wanted to name it something close to the Animal 'Kingdom', but obviously that wasn't possible so they eventually decided to put in the name 'Heart' in the title and that's how they got the name 'KINGDOM HEARTS' for the whole series. Then Nomura was asked about the HD remaster. He replied that the original data for the first KINGDOM HEARTS title was lost, so they had to resort to recreating a lot of its assets, based on scraps of information they could find. It was hard work, according to Nomura, but the final product turned out good enough in his mind. Nomura continued about FINAL MIX and his intentions towards bringing it to the rest of the world. Eventually he could do so, but he didn't want to make too many titles on their own, so including at least two titles and a 'movie' in one package was, according to him, a good idea. Then Nomura was asked about his favorite character in the series, and surprisingly he responded with Master Xehanort and his various incarnations, mentioning Ansem Seeker of Darkness from KH1 as his special favorite. Asked about worlds in the KH series, Nomura mentioned Jungle Book and that they have numerous times tried to implement it in a number of games, but each time it gets cut, much to his dismay. - Yasumoto commiserates with Nomura, who is very tired and has been doing a lot of talking today. - Nomura caught a cold just before departure, and he is losing his voice and trying not to cough. - Nomura hasn't been walking around E3 as he has been in interviews the whole time due to the big announcements. - Yasumoto reads a basic intro to the KH series. - They note that KH 1.5 has already released in Japan, and will release overseas in September. - As the trailer plays, Yasumoto gives a basic description of KH 1.5 and mentions speaking with animation supervisor Tatsuya Kando about KH 1.5 on the Square Enix Channel radio show in March. - When Yasumoto mentions being impressed at the length of and the effort put into the Days video volume, Nomura says that they didn't intend on making it so long from the beginning, and that they actually began work without being sure how long it would end up. He says that as it became so long anyway, he almost wishes he had just gone and made an actual film. - Nomura affirms that it was difficult to create the HD remaster. He says that as the original title was so old, almost all the original data was gone. The programmers began the project by digging around for data, and they had to work out everything for themselves bit by bit, as they were working with other people's programs rather than programs they had made themselves. It was apparently a huge job to recreate everything. —We were surprised that you would release a KHIII trailer so soon, what with KH 3D [Dream Drop Distance] (hereon KH3D) and KH -1.5 HD ReMIX- still so recent. Nomura: I know there are many fans who are restless because we have only released spin off titles since KHII, so I decided to announce it along with FFXV. Looking at the stage of development, though, I do think perhaps it is a bit early to be announcing it. —However, it does seem like the visuals already have a solid direction. Nomura: Among the developers we are calling the visuals ‘Kingdom Shader’. On original worlds, this is the feel the characters will have. The Shader will adjust depending on the world, so the visuals will match with the style of each Disney World. —Like FFXV, is KHIII being developed on Luminous Studios? Nomura: At present, we are going with Luminous as our main and undergoing investigations. The porting to both PS4 and Xbox One, working by overengineering, is the same. For the section of battle in the trailer we showed, we didn’t have time to prepare a clip of it working on the existing equipment because of tool issues, so instead we made an FMV that would give a feel for what is possible in realtime. Even so, the way it moves doesn’t look much different at all in realtime. —Please tell us how the action in KHIII will have evolved. Nomura: Right now there’s a demo version that works on our existing equipment… and it’s an absolute storm (laughs). It goes even beyond ‘bold action’. In KHIII you will have a three person party, but depending on the world NPCs will also join in fighting, basically, we’re developing some very flashy action. You’ll be flying through the sky unfolding into air battles without landing. Nomura: I suppose so (laughs). The enemy AI is becoming rather elaborate, and we’d like for coordinated action to flow from enemies and allies alike. For example, there’s a vehicle-type enemy, and we’ve already got Sora being able to ride that enemy all around during battle. —Lastly, a message for your fans. Nomura: FFXV and KHIII are projects that exist as great rival projects that polish each other up as they are developed. At our private conference, despite KHIII being the lucky last and being at a low stage of development, I’m aleady feeling a response. For KHIII, developments unseen in the KH series so far involving online elements are under investigation, so please look forward to upcoming news. This year in Japan we will be exhibiting at Tokyo Game Show and at Disney’s D23 Expo Japan event, so I think there will be more information available around those times. Auch die Dengeki bekam die Gelegenheit Tesuya Nomura zu interviewen. Es wurde über die E3 geredet, aber letztendlich auch über Kingdom Hearts III! ---You've unveiled the long awaited Kingdom Hearts III. Nomura: The clip was a teaser through and through, so we didn't give away much information. Things like Sora's outfit and battle gameplay are still to be revealed, so please look forward to that. ---It seems the look of the characters is different from usual...? Nomura: That would be because of what the developers are referring to as the 'Kingdom Shader', which adds shading to the base image generation of the original 'Kingdom Hearts' that reproduces the brush painting of Disney works in even greater beauty. ---Will the plot follow on from Kingdom Hearts 3D: Dream Drop Distance...? Nomura: Yes, that's right. It will be the last chapter in the Dark Seeker Chronicle that we have been expanding up until now. I am thinking of some ways to make it easier for newcomers to the series to join in. Nomura confirmed that KH3's story begins where Dream Drop Distance's left off. "We're proceeding along with which worlds we'll be selecting for the game," he said. "It's the final episode in the 'Dark Seeker' saga that began with the original KH, and it'll depict the final battle with Xehanort." The new visual style seen in the trailer reflects the results of a long trial-and-error effort. "We spent a while figuring out what direction to take KH's visuals in the next generation," Nomura said. "Should we go for a more realistic look like in recent projects, or try something else? Along the way, we remembered that these KH characters were originally paintbrush art from Disney productions, a texture that was one of our original aims, and that it was time to return to that. So [chief creative director Takeshi] Nozue went through a series of tests, and the results are the visuals that we refer to in the team as the Kingdom Shader. It may look like a pretty drastic change, but I see it as a rich evolution of everything we've shown you up to now." How is KH's gameplay evolving? "We have a demo version running on the actual hardware, but the action's pretty frantic. The really bold action we've always had is getting even crazier. KH3 has three-person parties, but NPCs and other characters join the fight in each individual world, and the resulting action is really flashy and exciting. The enemy AI is a lot more intricate, too, and I think the gameplay will reflect that new dynamic balance. For example, there's a foe that's shaped like a vehicle, and Sora may jump on it and fly around; that's already implemented." It'll still be a while before KH3 comes out, but Nomura promised that it'll be back in the public spotlight soon, either at the Tokyo Game Show this fall, the Disney-oriented D23 Expo Japan event in October, or both. "The FF15 and KH3 teams are aware of each other," he said. "They're constantly honing their work at this point in development. Even though KH3 is still pretty early in development, it's already producing some great scenes in Square Enix's internal conferences. 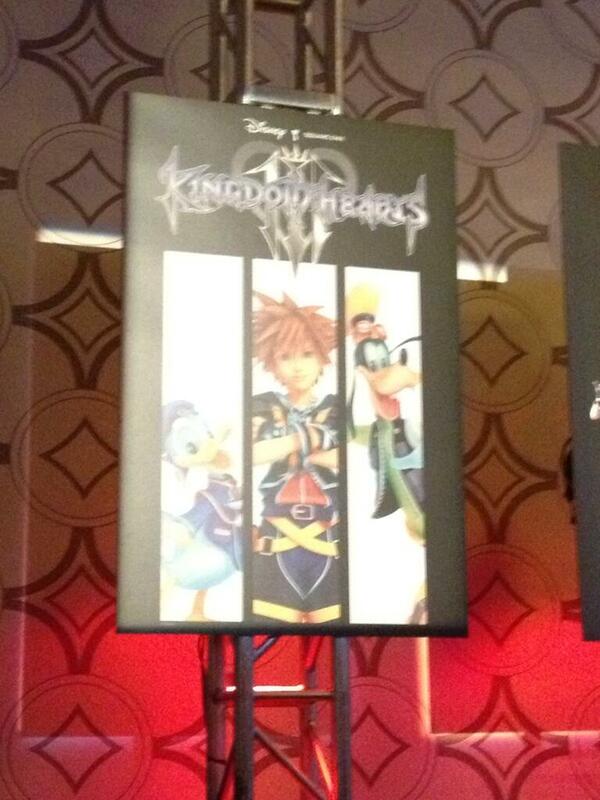 We're discussing new developments never seen in any KH before, so keep an eye on further updates." Auch das Magazin Edge-Online erhielt ein Interview! So, Kingdom Hearts 3: what took you so long? Tetsuya Nomura: So we received great reviews for Kingdom Hearts 2 and so of course the expectation for 3 became much higher. And to make the game appropriate in terms of story, systems and the world – to reach the fans’ expectations – it just ended up taking some time. What’s the relationship with Disney like? Disney’s attitude to games has changed in recent years to become focused on mobile and social games. Have you noticed their attitude change much? The relationship with Disney has [remained] the same. Actually the contact person at Disney is still the same person from Kingdom Hearts 1, and Disney has given us lots of requests in terms of the Kingdom Hearts franchise and they did mention some smaller titles for other platforms, but our common, most important goal was to [complete] Kingdom Hearts 3. So it’s the same. Fans of the series would be quite happy for the game to be the same as the last one, but as a designer and developer don’t you want to experiment and do new things? How do you balance those desires in Kingdom Hearts 3? As you know, it took a while to actually announce Kingdom Hearts 3, but in the meantime we announced several spin-off titles in the series, and each time for the spin-off title we did experiment and challenge with new things. So we did definitely feel like we have reached enough experimentation and experiences and also I do the development of Final Fantasy, so I feel like for this Kingdom Hearts 3 we are putting everything – all of the experimentation and experiences – into this new title. The combat in Final Fantasy XV looks real-time instead of turn-based, is that a complete change for the series? Are you making an action game now? The Final Fantasy series – if you look at each title – each of them has a different system and a different story, so that’s the trend of the Final Fantasy [series] in the past. And when we decided to do action-based for Versus XIII, I personally thought: Is that Final Fantasy? So that was actually one reason why the title was called Versus XIII, not the main sequel, main title, for Final Fantasy. But if you look at the other titles in the franchise, XI and XIV are MMORPG so they do use battle systems which is a command-based, turn-style battle system. So it’s not quite the typical RPG… so that’s why we decided why [Final Fantasy XV] could be action-based battle. And in the future, if other teams decide to different styles of battle systems, then that’s what they decide to do. So why were you at Sony’s conference and not Microsoft’s? Have you chosen your favourite already? So, why not Microsoft? Until the last minute we actually didn’t know which conference we would be in, and there was a possibility not to be in the Sony conference either. So it was simply the arrangement between the companies and also originally Versus XIII was announced for PlayStation 3 several years ago. That’s why we thought it’s just probably proper to just go to them and discuss and if they decided to put it on then we would see. What did you think of E3? Was there anything in particular that excited you? So of course I was aware of the specifications of each new next-gen console because we are working on them, so there was no specific impact that I got from the announcements in that [respect]. But I was more curious about the software that would be announced. Some of the contents looked really interesting to me and I was preparing for my own presentation of my own games, so I was also very nervous of what other companies would present. Do you feel comfortable now that you’ve seen everyone else’s games and put yours out there alongside them? The more contents I saw, with each new trailer before mine, I was getting more worried [laughs]. So of course I’ve been seeing my own trailer so many times that I’m accustomed to watching it so I can’t tell if it’s great any more because I’m so used to watching it. I know my team is working so hard and they agree, but I’ve never done that comparison of looking at my title and trailer with others so that’s why I was nervous. What does the next generation of consoles mean to you, the games you make, and to Square Enix in general? So in terms of my own titles that I directed, for the current generation consoles, I have to admit that our company was a little bit behind in terms of development. Talking about my own titles, Kingdom Hearts 1.5 HD is not yet released in the UK, Europe and US even after the announcement of next-generation consoles, and 1.5 is for PlayStation 3. But in the meantime we were already in the development of Kingdom Hearts 3 and Final Fantasy XV for next-generation consoles, so we definitely have to catch up with the rest of the gaming world with those titles and in the future Final Fantasy XV most likely will be released sooner than Kingdom Hearts 3. And I think for Square Enix Final Fantasy XV will be the flagship title for the next-generation consoles, and after that we will definitely make more titles for those platforms. In der letzten Famitsu Weekly war ein Beitrag zu Kingdom Hearts III dabei! Unter den Artikelbildern befindet sich der Text auf Englisch übersetzt! At E3 2013, the production of the latest entry of the series KINGDOM HEARTS III is announced! In the KINGDOM HEARTS series so far, Sora learns that Master Xehanort is mercilessly plotting to start a war between the Darknesses and the Seven Guardians of Light. King Mickey and Riku are searching for Keyblade wielders who fought in an intense battle before and Sora, Donald, and Goofy are searching for the “Key to Return Hearts”. They will once again travel to various Disney worlds. In KINGDOM HEARTS Birth by Sleep, Eraqus passed down his Keyblade to Aqua and now Sora is holding it. They’re traveling to search for the “Key to Return Hearts”? Sora challenges Master Xehanort in the final battle!! KINGDOM HEARTS II was released on the Playstation 2 on 2005 and several spin off games were released on portable devices therefore thickening the story and the world settings in the KINGDOM HEARTS series. In the latest game, KINGDOM HEARTS III competes this story. Earlier, we revealed the visuals for Sora and friends. We have comments from the director, Tetsuya Nomura. Q: The story this time will start after KINGDOM HEARTS 3D [Dream Drop Distance]? A: Yes, we are currently deciding on selecting new worlds. It continues the Seeker of Darkness saga as the last chapter. The final battle between Master Xehanort draws near. Q: Seeing how the story flowed in KINGDOM HEARTS 3D [Dream Drop Distance], is there a possibility that, along with Sora, Riku and Kairi will be playable? A: I cannot say no the possibility. Q: What was the intention behind the heartwarming and unique visuals? A: This is what a next generation KINGDOM HEARTS should look like... in the recent years, we questioned whether it should go a realistic route or a different one and we continued to work on these models. Originally for the KINGDOM HEARTS characters, we aimed for a texture that resembled Disney illustrations and that is how it came to be. We asked Nozue to keep testing and as a result of testing thoroughly, we developed the KINGDOM SHADER, which is the name of the visuals. While it may seem like a sudden change, this is what I’ve wanted to show you. It has evolved into something rich. Q: How has the action in KINGDOM HEARTS evolved? A: Currently, I have a demo version where you can actually move around and it is rampant (laughs). In every world, NPCs can participate in battle with flashy moves. Enemy and friend AI can become more elaborate as you progress through the game. For example, I’m already working on plenty of enemies whom are like vehicles that you can ride and fly during battle. Q: Sora became a Keyblade Master in KINGDOM HEARTS 3D [Dream Drop Distance]. Like Aqua and the others, their Keyblades have changed? A: Yes. During the Mark of Mastery Exam, their Keyblades have already changed. Q: Finally, do you have a message to say to your fans? A: The development teams of FINAL FANTASY XV and KINGDOM HEARTS III have a friendly competition between each other. In the sneak preview, I feel like a little bird has spread the information already but to a low degree. In KINGDOM HEARTS III, online elements are being considered for the KINGDOM HEARTS series. Please wait for more information in the future. In such timing this year, Tokyo Game Show and a Disney event, D23 Expo Japan, held in October will reveal more information. These are Sora and his friends in KINGDOM HEARTS III. The CG renders feel like heartwarming illustrations. You will see characters such as Riku and Kairi soon. A Keyblade Master who is the protagonist of the series. A little short tempered but he is a court magician of royalty. A royal court knight who has a gentle strong heart that thinks about his friends. Ebenfalls hat die Dengeki Playstation weitere Infos zum Spiel Kingdom Hearts III! • This time the teaser trailer revealed little information. In the test, were you to run away from there as quick as possible although it isn’t a rendered scene unlike FINAL FANTASY XV, it was actually moving very close to real time. The costumes and battle system are reintroduced. • Throughout the trailer, the textures are changed in order to shape it to the next generation of KINGDOM HEARTS. • It is the final chapter of the Seeker of Darkness saga but we’re thinking of a way for beginners to easily get into the game. We’re considering smartphone and online support as well as for FINAL FANTASY XV. • The development process is very enthusiastic and the selection of worlds isn’t finalized yet. • Spin offs continued to release for years but the goal was to keep the fans at peace by revealing the latest entry in the series. Although not immediately, information is expected to be revealed at D23 Expo Japan or TGS. Popular voice actors in the series gather for D23 Expo Japan. You may want ask the voice actors about their lives to keep up-to-date or about the series on stage. Erst ein Artikel, dann ein weiteres Interview der Famitsu! Nomura: I know there are many fans who are restless because we have only released spin off titles since KHII, so I decided to announce it along with FFXV. Considering the stage of development, though, I do think perhaps it is a bit early to be announcing it. Nomura: Among the developers we are calling the visuals the ‘Kingdom Shader’. On original worlds, the characters will go around with that feel to them. Then, to match the style of each Disney World, the Shader will adjust the visuals depending on the world. ---We weren't expecting the soft, illustrated feel as seen in the KH3D movie, rather than a more realistic look. Nomura: Perhaps the ordinary course of things would be to go with the realism close to the visuals in the movies so far, but then there wouldn't be any surprises, would there? I think the same thing about existing things like cel shading, too. ---How did you come up with these visuals? Nomura: How should next-gen Kingdom Hearts be... should I go with the realism from recent works, or go with something different? I thought long and hard about several answers. From that, I knew we had to go back to our original goal for the graphics of the Kingdom Hearts characters: evoking the feel of the brush paintings in Disney works. So, I called on (Mr Takeshi) Nozue and we did test after test, and the result of all our investigating is the 'Kingdom Shader'. Because we are skipping a generation of hardware with our numbered titles, Kingdom Hearts II having been released on PS2, perhaps it will seem like we are changing things too radically. However, we are doing our utmost best to take everything you have seen so far and evolve it to be even richer. Nomura: We are currently verifying going with Luminous as our main. Working on an over-spec and porting to both PS4 and Xbox One is also going to be the same. In the trailer we showed, for the battle section we didn't have time to prepare a clip of it working on the actual hardware because of tool issues, so instead we made a concept FMV that depicts what is possible in realtime. That said, the actual thing working in realtime doesn't look much different at all. ---And development is being handled by the Osaka team responsible for KH Birth by Sleep, KH3D and KH -1.5 HD ReMIX-? Nomura: The base is the Osaka team. With (Mr Tai) Yasue as Co. Director, they are working in conjunction with the Tokyo Kingdom Hearts staff. ---We're interested in how the action in KHIII will have evolved. Nomura: Right now there’s a demo version that runs on the hardware… and it’s an absolute storm (laughs). It goes even beyond ‘bold action’. In KHIII you will have a three person party, but depending on the world NPCs will also join in fighting. Basically, some very flashy action will unfold. You’ll be flying through the sky flowing through air battles without landing. ---Even just from watching the Shadows in the trailer moving we certainly can tell that the enemies have evolved. And, on the other side, Sora has gained powers befitting a 'Keyblade Master', hasn't he? Will he be able to transform his Keyblade? Nomura: In this stage of testing he can transform it. By the way, in the trailer, Sora picks up the Keyblade belonging to Master Eraqus that Aqua had. We put that together in order to remind you of the story of KHIII, as this time we weren't able to prepare a scene that would show you a portion of the drama. ---That means the story begins after the end of KH3D, doesn't it. Nomura: Yes. We are currently working through the selection of new worlds. As this is the last chapter of the Dark Seeker Chronicles that has been going since KH1, there will be a final showdown with Xehanort. ---If the story continues from KH3D, then is it possible that we will be able to control not only Sora but other characters such as Riku and Kairi? Nomura: I can't say the possibility is zero. Nomura: ......What indeed (laughs). The last part of KH3D was meant to be tentative foreshadowing. ---So perhaps we can get our hopes up (laughs). Lastly, a message for your fans. Nomura: FFXV and KHIII are projects that, like great rivals, polish each other up as they develop. At our private conference, despite KHIII being the lucky last and being at an early stage of development, I I already felt the response. For KHIII, developments unseen in the KH series so far involving online elements are under investigation, so please look forward to upcoming news. This year in Japan we will be exhibiting at Tokyo Game Show and at Disney’s D23 Expo Japan event, so I think there will be more information available around those times. Ich habe alle bisherigen Kingdom Hearts III Bilder in einer kleinen Galerie für euch zusammengestellt! Diese findet ihr auch im Startpost! Auf der diesjährigen D23 Expo wurde einer exklusiven Gruppe ein neuer Trailer hinter verschlossenen Türen gezeigt. Es herrschte strengstes Fotografier- und Filmverbot! Aber die Besucher durften nach der Privatvorführung ihre Eindrücke twittern. zu finden waren (Im Programmcode zu finden): Toy Story. On the scene where Sora wields 2 guns, it seems that the guns are related to an attraction with the little green men. (Japanische Textzeile); is what the little green men in Toy Story are called officially in Japanese, so maybe we have Toy Story confirmed. Maybe. In diesem Video kommt Tetsuya Nomura zu Wort. Er erklärt einige Dinge rund um Kingdom Hearts III und dessen Entwicklung. Hier ist noch ein Gameplay - Video. Wenn das wirklich PS4 Grafik sein soll, finde ich diese nicht so überragend. und erscheint mit hoher Wahrscheinlichkeit erst 2015! und auf deutsch bedeuetet das was? deshalb muss man sich während der Entwicklung wahrscheinlich wieder zwischen manchen Features entscheiden. versucht er das Beste zu machen, was ihm möglich ist. 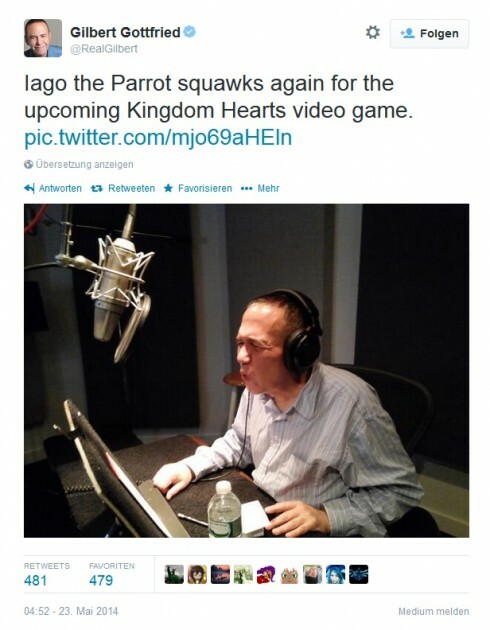 Wie es aussieht haben bereits die Arbeiten an der englischen Lokalisierung von Kingdom Hearts III begonnen.